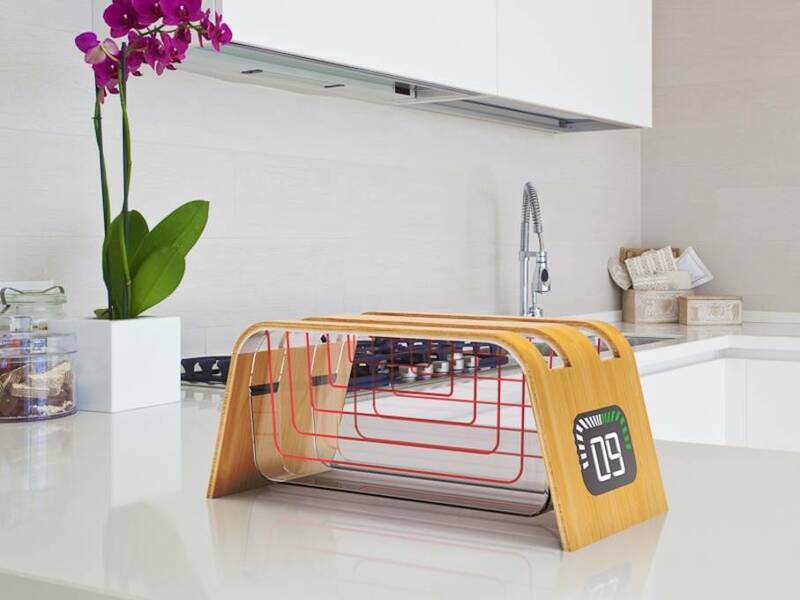 The Eco+ toaster concept from industrial designer James Stumpf is designed using a steam-bent bamboo plywood chassis, enclosed glass toasting trays, a 50mm x 25mm touchscreen and heating coils embedded within the glass toasting trays. Gone is the bizarre popup mechanisms of toaster’s past – the toaster features wide, easy access slots. The heating coils feature quick-cooling technology and the UI tells the user when its safe to grab their toasty treats. Bamboo and glass are both sustainable and renewable and the design uses no plastic and minimal metal. All wiring and electronics run through hollow channels in the bamboo frame.